SERVTECH’s training courses are administered utilizing step lock performance based training. This format is widely accepted in the Semiconductor industry as the most effective method for training operators, maintenance personnel, and process engineering staff. These courses have been tested at major semiconductor manufacturers, resulting in complete customer satisfaction. All training will be performed on-site at your facility. The Basic Operations course trains participants to become certified to perform basic equipment operations, preventative maintenance, and efficiently use the technical manuals. For the more experienced technicians and engineers, SERVTECH offers an Advanced Maintenance and Troubleshooting course. Do you want to train all your employees correctly and sufficiently on your Canon steppers? SERVTECHS's training courses for the Canon FPA-3000 i-line and EX series steppers are administered utilizing step lock performance based training. This format of training is widely accepted in the Semiconductor industry. These courses have been tested at major semiconductor manufacturers, and resulted in complete customer satisfaction. 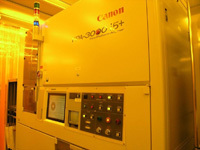 It is the most effective method for training operators, maintenance personnel and engineering staff on Canon steppers. All stepper training will be performed on-site at your facility with our experienced instructor. Our instructor John Lester has more than 20 years of Canon instruction expertise related to the 3000 series steppers and has spent 17 years as an instructor for Canon USA. John is able to bring his knowledge and experience to these courses, and is able to custom his training programs to meet our client's needs and objectives. We offer five courses for the Canon FPA-3000 i-line and Ex series steppers including the following: stepper operation, preventive maintenance, software training, advanced maintenance, and troubleshooting. We offer a one-week course specifically for stepper operation. This stepper-training course is designed for operators, process engineers and maintenance personnel. Within this one-week course, students will learn how to perform safety checks and systems status checks. As well as system startup, shutdown, reset and subsystem resets. Students will also learn and perform console software navigation, job selection, load and configuring, unit description, sequence of operations, and basic fault recognition. Last but not least, students will be educated on and be able to perform daily testing (SRC, BLC, IUC, ALFC). SERVTECH understands the importance of having your operators, process engineers and maintenance personnel correctly and safely trained on your Canon steppers. That's why we are here to offer the most effective method of training and to ensure complete customer satisfaction.